Australian convicts formed into a chain gang – a sketch made near Sydney in 1842. What is it that makes us human? The question is as old as man, and has had many answers. For quite a while, we were told that our uniqueness lay in using tools; today, some seek to define humanity in terms of an innate spirituality, or a creativity that cannot (yet) be aped by a computer. For the historian, however, another possible response suggests itself. That’s because our history can be defined, surprisingly helpfully, as the study of a struggle against fear and want—and where these conditions exist, it seems to me, there is always that most human of responses to them: hope. The ancient Greeks knew it; that’s what the legend of Pandora’s box is all about. And Paul’s First Letter to the Corinthians speaks of the enduring power of faith, hope and charity, a trio whose appearance in the skies over Malta during the darkest days of World War II is worthy of telling of some other day. But it is also possible to trace a history of hope. It emerges time and again as a response to the intolerable burdens of existence, beginning when (in Thomas Hobbes’s famous words) life in the “state of nature” before government was “solitary, poor, nasty, brutish and short,” and running like a thread on through the ancient and medieval periods until the present day. I want to look at one unusually enduring manifestation of this hope: the idea that somewhere far beyond the toil and pain of mere survival there lies an earthly paradise, which, if reached, will grant the traveler an easy life. This utopia is not to be confused with the political or economic Shangri-las that have also been believed to exist somewhere “out there” in a world that was not yet fully explored (the kingdom of Prester John, for instance–a Christian realm waiting to intervene in the war between crusaders and Muslims in the Middle East–or the golden city of El Dorado, concealing its treasure deep amidst South American jungle). It is a place that’s altogether earthier—the paradise of peasants, for whom heaven was simply not having to do physical labor all day, every day. 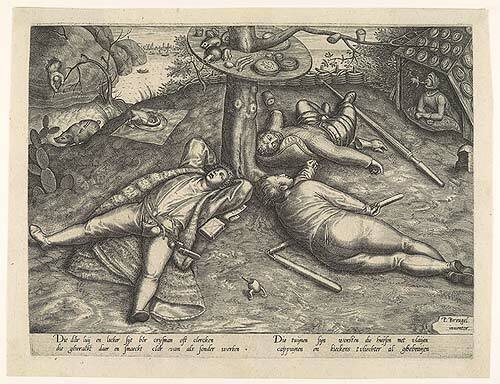 The Land of Cockaigne, in an engraving after a 1567 painting by Pieter Bruegel the Elder. Cockaigne was a peasant’s vision of paradise that tells us much about life in the medieval and early modern periods. A sure supply of rich food and plenty of rest were the chief aspirations of those who sang the praises of this idyllic land. It is far from clear, from the fragmentary surviving sources, just how real the Land of Cockaigne was to the people who told tales of it. Pleij suggests that “by the Middle Ages no one any longer believed in such a place,” hypothesising that it was nonetheless “vitally important to be able to fantasise about a place where everyday worries did not exist.” Certainly, tales of Cockaigne became increasingly surreal. It was, in some tellings, filled with living roasted pigs that walked around with knives in their backs to make it all the easier to devour them, and ready-cooked fish that leaped out of the water to land at one’s feet. But Pleij admits it is not possible to trace the legend back to its conception, and his account leaves open the possibility that belief in a physically real paradise did flourish in some earlier period, before the age of exploration. 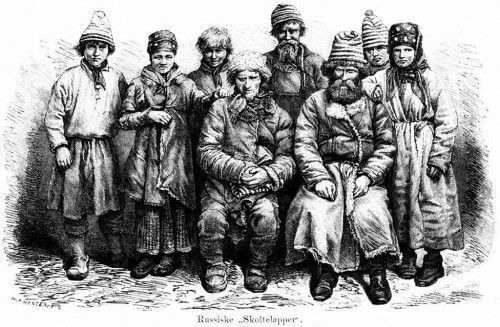 Finnish peasants from the Arctic Circle, illustrated here after a photograph of 1871, told tales of the Chuds; in some legends they were dwellers underground, in others invaders who hunted down and killed native Finns even when they concealed themselves in pits. It is far from clear how these 17th-century troglodytic legends morphed into tales of the paradisiacal underground “Land of Chud” reported by Orlando Figes. the peasantry believed in a Kingdom of God on this earth. Many of them conceived of heaven as an actual place in some remote corner of the world, where the rivers flowed with milk and the grass was always green. This conviction inspired dozens of popular legends about a real Kingdom of God hidden somewhere in the Russian land. There were legends of the Distant Lands, of the Golden Islands, of the Kingdom of Opona, and the Land of Chud, a sacred kingdom underneath the ground where the ‘White Tsar’ ruled according to the ‘ancient and truly just ideals’ of the peasantry. 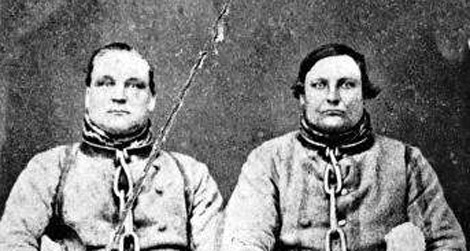 Two convicts in chains – a photo frequently said to depict a pair of Australian prisoners. The real story emerged as a result of the original publication of this essay on the Smithsonian site – see comments. So, desperate peasants were capable, in certain circumstances, of taking great risks in search of a physical paradise—and the more desperate they were, perhaps, the more willing they would be to risk their necks for it. The third and last legend that I want to consider here suggests as much. It dates to the last years of the 18th century and flourished among a group of men and women who had very little to lose: unhappy convicts who found themselves being transported from Britain to penal colonies established along the newly discovered–and inhospitable–east coast of Australia. Beginning in 1787, just a few years after the American War of Independence closed off access to the previous dumping-ground favoured by the government in London, tens of thousands of criminals found themselves disembarking on the edges of a continent that had scarcely been explored. Among them were large contingents of Irish men and women, the lepers of Britain’s criminal courts, and it was among the members of this fractured and dislocated community that an even stranger myth sprang up: the idea that it was possible to walk from Botany Bay to Beijing. China, not Cockaigne or Belovode, became the land of paradise for these believers. Arthur Phillip, first governor of New South Wales, hoped that the craze for “Chinese traveling” was “an evil that would cure itself.” He was wrong. Of course, few Irish petty criminals (and most of them were petty; it was possible to be transported for seven years for stealing sixpence-worth of cloth, or pickpocketing a handkerchief) had any education in those days, so it is not surprising that their sense of geography was off. The sheer scale of their delusion, though, takes a little getting used to; the real distance from Sydney to Peking is rather more than 5,500 miles, with a large expanse of the Pacific Ocean in the way. Nor is it at all clear how the idea that it was possible to walk to China first took root. One clue is that China was the principal destination for ships sailing from Australia, but the spark might have been something as simple as the hopeful boast of a single convict whom others respected. Before long, however, that spark had grown into a blaze. A total of 17 male convicts absconded on this occasion, taking with them a pregnant woman, wife to one; she became separated from the remainder of the group and was soon recaptured. Her companions pressed on, carrying with them their work tools and provisions for a week. According to their information, China lay no more than 150 miles away, and they were confident of reaching it. Faith in the idea that it was possible to walk from Australia to China depended on hazy notions of geography. The real distance is around 5,000 miles. For the overstretched colonial authorities, it was all but impossible to dissuade other Irish prisoners from following in the footsteps of the earliest bolters. Their threats and warnings lacked conviction; Australia was so little explored that they could never state definitively what hazards absconders would face in the outback; and, given that all the convicts knew there was no fence or wall enclosing them, official attempts to deny the existence of a land route to China seemed all too possibly self-serving. Before long, a stream of “Chinese travelers” began to emulate the trailblazers in groups up to 60 strong–so many that when muster was taken in January 1792, 54 men and 9 women, more than a third of the total population of Irish prisoners, were found to have fled into the bush. 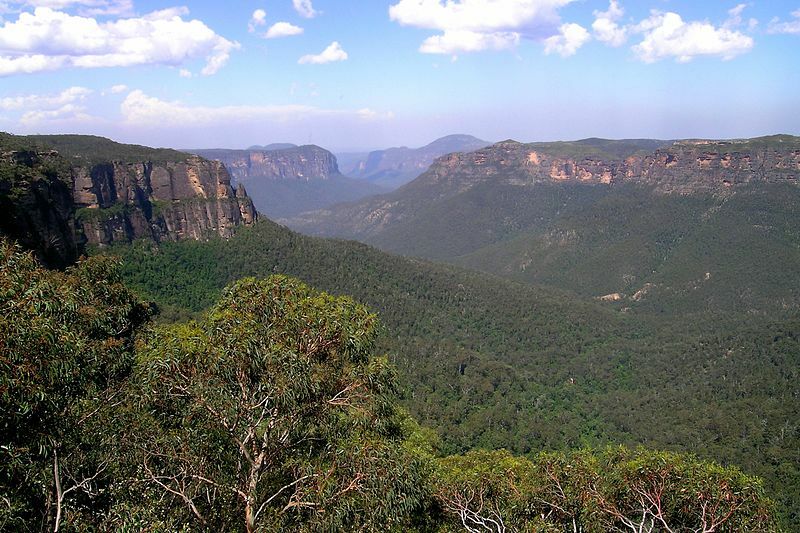 The Blue Mountains formed an impassable barrier to early settlers in New South Wales. Legends soon grew up of a white colony located somewhere in the range, or past it, ruled by a “King of the Mountains.” Not even the first successful passage of the chain, in 1813, killed off this myth. Over time, the regular discovery of the skeletons of those who had tried and failed to make it overland to China through the bush did eventually dissuade escaping convicts from heading north. But one implausible belief was succeeded by another. 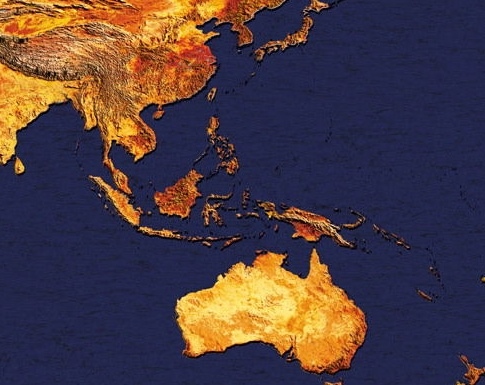 If there was no overland route to China, it was said, there might yet be one to Timor; later, tales began to circulate in the same circles of a “white colony” located somewhere deep in the Australian interior. This legend told of a land of freedom and plenty, ruled over by a benevolent “King of the Mountains,” that would have seemed familiar to medieval peasants, but it was widely believed. As late as 1828, “Bold Jack” Donohoe, an Irish bushranger better known as “the Wild Colonial Boy,” was raiding farms in outlying districts in the hope of securing sufficient capital to launch an expedition in search of this arcadia. The colonial authorities, in the person of Phillip’s successor, Governor King, scoffed at the story, but King hardly helped himself in the manner in which he evaded the military regulations that forbade him to order army officers to explore the interior. 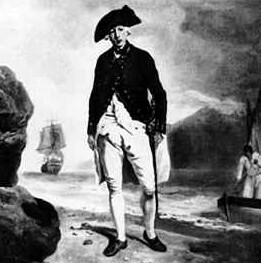 In 1802 he found a way of deputing Ensign Francis Barrallier to investigate the impenetrable ranges west of Sydney by formally appointing him to a diplomatic post, naming him ambassador to the King of Mountains. Barrallier penetrated more than 100 miles into the Blue Mountains without discovering a way through them, once again leaving open the possibility that the convicts’ tales were true. 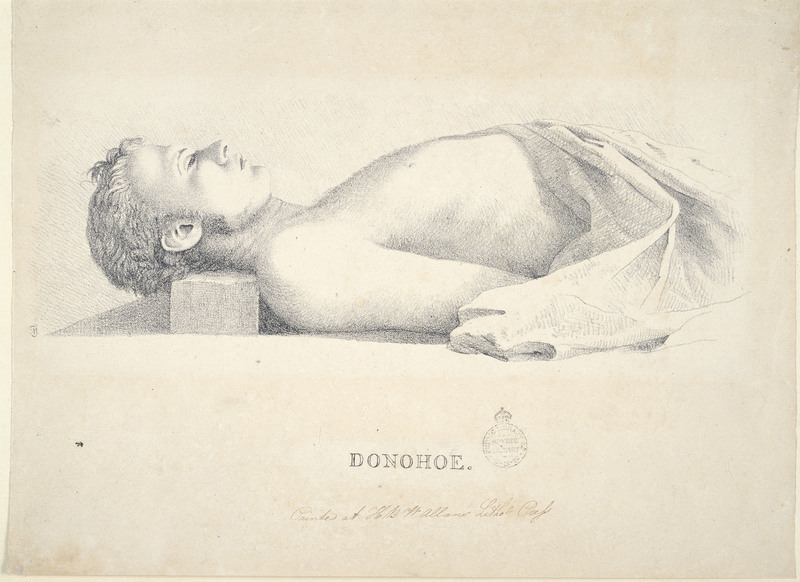 The bushranger Bold Jack Donohoe in death, soon after he began raiding farms in the hope of obtaining sufficient supplies to set out in search of the “white colony” believed to exist somewhere in Australia’s interior. Daniel Field. “A far-off abode of work and pure pleasures.” In Russian Review 39 (1980); Orlando Figes. Natasha’s Dance: A Cultural History of Russia. London: Penguin, 2003; Robert Hughes. The Fatal Shore: A History of the Transportation of Convicts to Australia, 1787-1868. London: Folio Society, 1998; David Levell. Tour to Hell: Convict Australia’s Great Escape Myths. St Lucia, QLD: University of Queensland Press, 2008; Felix Oinas. “Legends of the Chuds and the Pans.” In The Slavonic and Eastern European Journal 12:2 (1968); Herman Pleij. Dreaming of Cockaigne: Medieval Fantasies of the Perfect Life. New York: Columbia University Press, 2001; R.E.F. Smith (ed). The Russian Peasantry 1920 and 1984. London: Frank Cass, 1977; Richard Stites. Revolutionary Dreams: Utopian Vision and Experimental Life in the Russian Revolution. New York: Oxford University Press, 1991. Hope, this madness of the sane. Fascinating read, as always. How has this one been left without any comments so far? Hard to say, really. Perhaps people don’t find these going-ons so strange after all. I am 70 now and I smile as I read this. When I was young, I used to believe readily all kinds of crackpot stories and I was nowhere near in the dire straits those convicts were. In the 21st century, I once heard on tv someone ask how many hours drive there were between London and Stockholm. Another time, I was in a bar in Detroit, Michigan and the bartender asked me, since I had a different accent, where I was from. I said right across the river, Canada. He said: “That’s not Canada, there, that’s Ontario.” I have also met some university graduates who are more or less illiterates. I used to write better than they in 2nd grade. My own sister in law, when looking at one of my daughter’s toy and seeing “made in Norway” on it, asked me: “What’s Norway?” – meaning, what kind of material is it? What’s really amazing is that there are (were?) toys made in Norway available for purchase. I thought the Chinese had a worldwide monopoly on toys. This Christmas I was amazed to notice that a toy truck my boy got from Santa this year bore the proud inscription Made in Germany. For many years I’ve been looking at labels and, ever since I was a boy, in the 80’s, toys were made in China (with very few exceptions which were made in other SE Asian countries). The only things German made I was aware of are cars and beer (since I can’t afford the former, I try to compensate with the latter). I hope our kind host will allow me this completely off-topic aside. For the sake of completeness, and because I have no idea how long the material may be available on the Smithsonian’s site, I am importing the thread of comments that led to the identification of the two men pictured in chains in the essay. This was a photo I originally sourced from MuseumVictoria, which identified it as representing an unknown pair of Australian convicts. The original correspondence took place in August-September 2012. Checking again now, I’m pleased to see the museum has updated its attribution. It seems to me that the picture you attribute to two Australian convicts is in fact a picture of two infamous Finnish criminals called Antti Isotalo (left in picture) and Antti Rannanjärvi, active around 1850 in Finland. They were sentenced to hard labour in Siberia, which at the time was a penal colony used also for convicts from Finland. The pair became sort of folk heroes in their time and there is even a popular poem/song about them, specifically popular among Finnish men, who ‘sing’ it especially when drunk. An interesting notion–and it’s true no one seems absolutely certain who the two men were. Museum Victoria, which holds the original of the photograph, certainly thinks they were Australian. Do you have any evidence to back up your theory? Those convicts on the first photo are Finns, not Australians. 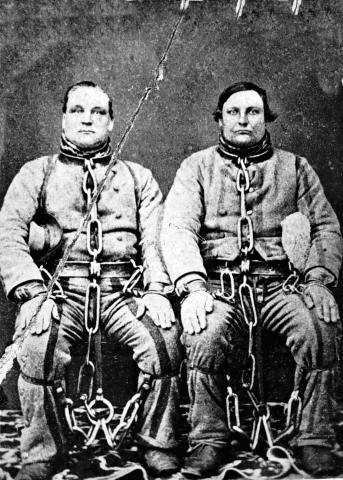 They are Antti Rannanjärvi and Antti Isotalo, infamous 1800-century criminals. You should check them out if you haven’t – their story is quite interesting. Fascinating. It certainly looks as though the photo is in circulation in Finland, then. Wikicommons attributes it to Härmänmaan Museot. And a brief burst of research suggests the image did appear on postcards in Finland as early as the 1920s. There is some suggestion the photographer may have been Julia Widgren (1842-1917). And an alternate, presumably altered, image, showing not two men but three, also exists. But can anyone cite a C19th archive or publication suggesting it does show Rannanjärvi and Isotalo? Australian archivists state it is sourced to an old photo album in their collection and at the moment I’d say the evidence suggests it found its way there years ago from a Russian or Finnish source. But an alternative explanation might be that the image is Australian, as MuseumVictoria suggests, but has since entered circulation in Finland and been misattributed. I’d be very interested to hear from more Finnish readers, and in the meantime I have put all this to MuseumVictoria, but their reply states they may take up to six weeks to get back to me. I’d love to know more about Antti and Antti, but sadly Wikipedia is uninformative and my Finnish not too hot. Can anyone summarise their story or point us to a source in another language? I truly hope that Smithsonian check photos a bit better. Antti Isotalo and Rannanjärvi were famous gangsters in Ostrobothnia-province in Finland around 1820-50, and got heavy sentences. My mother’s grandparent’s house was one place, where just caught Antti Isotalo was over night with guards on the way to Vaasa province prison and the trial. In those days roads were bad and trips took a long time. Maybe Smithsonian could use Finnish translators, as Finnish immigrants, and especially from Ostrobothnia, left in hundeds of thousends specifically between 1880-1924, and 1924 Finns were not accepted any more to U.S.A. I assume there could be a lot of stories and pictures of immigrant life. Maybe some help from Suomi College? I think there is no doubt at all that this picture was taken in 1869 by a Finnish photographer named Julia Widgrén in Vaasa, a Finnish town on the west coast of Finland, where Isotalo and Rannanjärvi were taken to court. In fact, this was most probably the best-known photograph taken by her, and image of it has been in the Finnish cultural memory, including educational material, for generations. I live now in Australia, but a friend of mine, who lives in Vaasa, will today try and visit the local Ostrobothnian Museum, where there may be more information available for reference. Another potential source for reference may be The Finnish Museum of Photography. Greetings from the Ostrobothnian Museum in Vaasa, Finland! We can confirm that the convicts are the famous criminals Antti Isotalo (1831-1911) and Antti Rannanjärvi (1828-1882) from the municipality of Härmä in Ostrobothnia. Isotalo and Rannanjärvi were two of the so-called knife fighters (research done by, for instance, professor Heikki Ylikangas at the University of Helsinki). As Mike Dash mentions above,the picture was taken by Julia Widgren, one of the first female photographers in Finland. The photo was taken around 1868/1869 in the jail of Mustasaari/Korsholm, when the two gangsters had been sentenced for (among other things) burglary, arson and forgery. The original photograph from the 1860s is part of the photo archives here at the Ostrobothnian Museum. However, the picture has been copied for decades, and even post cards have been made of the photo. This explains why there are so many copies of this picture on the Internet, and why there seems to be misattributed information in Australian museums. Thank you for the confirmation, Heidi. I think the correspondence we have had from you and our Finnish readers has some value, so rather than take the photo down we will adjust the caption. I will also forward your message to the staff at MuseumVictoria and with luck they will make changes to their attribution.